If ever there existed an ultimate symbol of the beauty embodied by birds, the resplendent quetzal would certainly qualify. 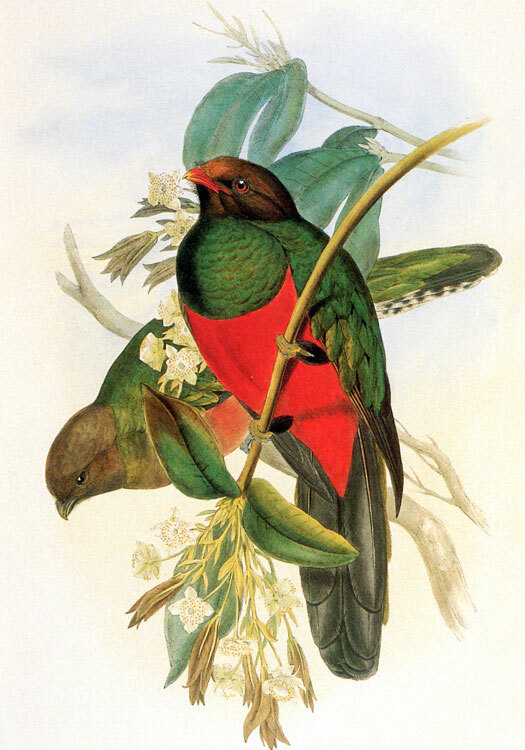 Rare, stunningly beautiful, elusive, and limited to the remote and mist-draped cloud forests of Middle America, this bird, with its shimmering golden green and blood-red feathers, is an artist’s dream. Most birders, if asked which tropical bird they would like to glimpse in its natural habitat sometime during their lifetime, would probably nominate the resplendent quetzal. To the pre-Columbian aborigines of Middle America the bird’s glorious plumes were more highly treasured than gold, and only high priests and royalty were allowed to possess and wear them. 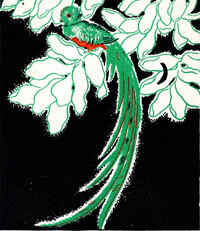 Ornaments made of the incredibly long, golden-green tail-coverts of the male quetzal adorned the heads of these personages; like the equally coveted and similarly rare jade, these feathers are the color of maize leaves and all the other green vegetation that gives life and beauty to the earth. set out on his downward journey, generous and contented. and the cheeks of the fruit. caressing the valleys, the forests, and seas. Thus was Music born on the bosom of Earth. In a similar way, birds once brought the first real music to our Earth, music that together with their great beauty and grace, we now all enjoy. It would be a much poorer and sadder world if the quetzal and all of its avian relatives were to disappear. 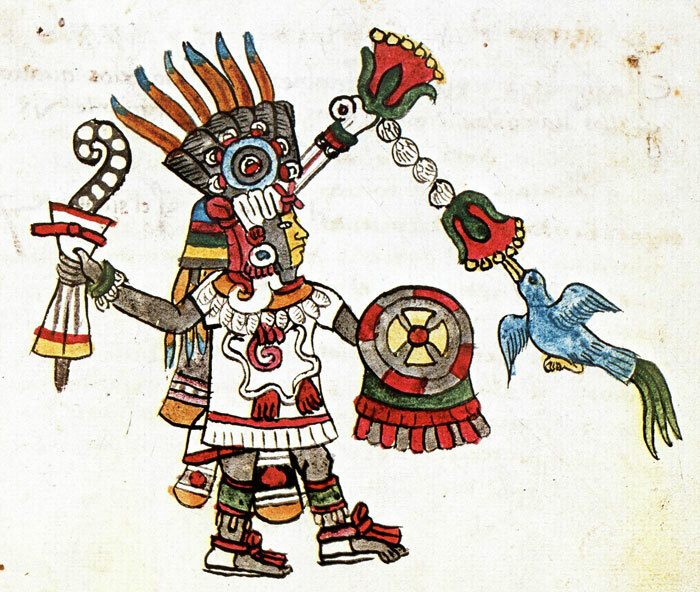 Then Earth would become a more silent and fearful place, as it was before we received, at least in these mythic traditions, the gift of Music from Quetzalcoatl. 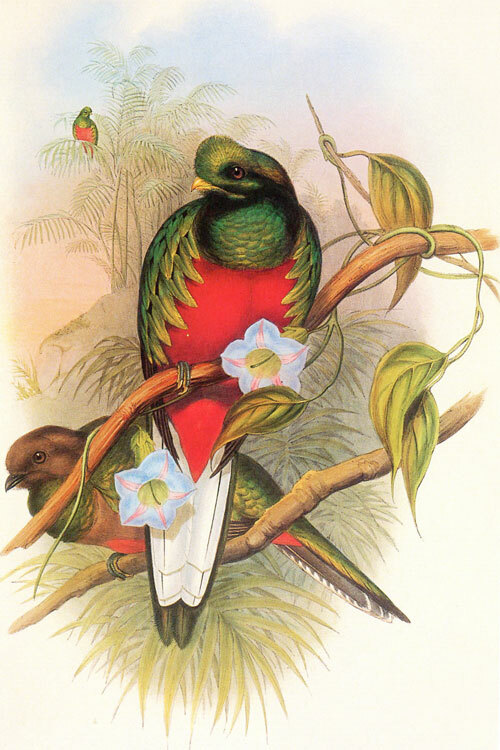 Colour illustrations: reproductions of 19th-century hand-coloured lithographs by John Gould, scanned from Trogons and Quetzals, op cit. ’A male quetzal’ scanned from Quetzal Quest by Victor von Hagen, OUP, 1940. NOTE! According to the famous English evolutionary biologist Sir Julian Huxley, it was the American historian and explorer Victor von Hagen who was ’the first man to bring the gorgeous and almost mythical Quetzal birds alive to Europe. You can see the birds he brought over in the Bird House at the London Zoo’. (Foreword by Julian Huxley to von Hagen’s book Quetzal Quest, OUP, 1940). Not any more you can’t, but the Zoological Society of London have confirmed to us that the ZSL purchased 3 male and 3 female quetzales from von Hagen on November 15th 1937; sadly three died the following year, one in 1939, and the remaining two survived till 1941. Why the heck would anyone use the word “aboriginals” for the Maya! This was a complex, sophisticated culture with many cities! 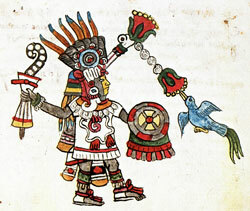 Mexicolore replies: Why the heck do you take ‘aborigine’ to be a pejorative term? Surely it just means original native inhabitant... Look it up for yourself!